In their never-ending quest to seek new lands, the Seafarers of Catan have set out on a voyage once more. Only this time, the seas aren't quite as friendly as before. Huge icebergs inhabit these waters. Only the most skilled seafarers can navigate through such perilous waters. 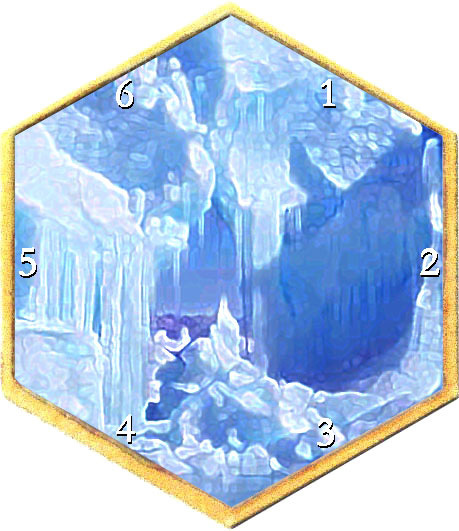 When building the board, replace several water tiles with iceberg tiles. Then, select a number chit and place it on each iceberg tile. A number chit with fewer dots will make the ice shift less often, while a number chit with more dots will make the ice shift more often. The more iceberg tiles and the more dots per number chit, the more treacherous the waters will be. When an icebergs number is rolled, rolled a single, 6-sided dice to see which way the ice has shifted. Any road or ship that is on the side where the ice shifted is destroyed and the token is removed from the board. This will affect the Longest Trade Route. Roads and ships may be rebuilt at their normal cost. Icebergs are not landmasses. Settlements and Cities cannot be built on intersections that contain only icebergs and water. Neither the bandit nor the pirate may be placed on an iceberg tile.